Familiarity, they say, breeds contempt. They obviously haven't heard of Rahul Dev. For every time the man took the ramp, there is an expectant hush, a collective sigh. Now, with Champion, due to release this month, Rahul hopes to recreate that same magic on the big screen. How did this shift from modelling to acting happen? Oh, way back in 1997, when I moved to Bombay from Delhi. I had acted in the film, Dus, but it got shelved due to the sad demise of its director, Mukul Anand. I had enrolled at an acting school to prepare for it. There, I became friends with Jatin (producer Sujeet Kumar's son), because of whom I am in Champion. You know, on our graduation day, we had a farewell party, and Jatin got drunk. In that state, he took down my number and, later, introduced me to his dad. How did you react when you got the role in Champion? Actually, I was completely involved in preparing for Dus at the time -- with the acting school. I got the role in Champion soon after I finished my acting course. My role has grey shades to it. The closest to my role here is what Shah Rukh did in Baazigar. In which, Shah Rukh wreaks revenge against the villain Dilip Tahil. What is your role in Champion about? I'm this happygoing guy, Naseer, very attached to my parents. At my sister's engagement, some cops come into my house. I start looking out for my dad, and find him on the terrace. My mother and sister are already there. I tell him about the police. He takes out a gun and shoots my sister, my mother and me. Then he shoots himself, saying, Mujhe maaf kar dena. All of them are declared dead, and I slip into a coma. When I come out of it, I am a shattered person, having lost everything. Suddenly, the happy bubble has burst, and I soon realise that another family is directly responsible for the destruction of mine -- that is the family that frames my father. My father, who owns a fireworks factory, is accused of hiding some arms and ammunition there. Too self-respecting and humiliated to go to court, he kills himself. And Naseer decides to take revenge on the family which destroyed his. He manages to kill the father and mother of that family, but the child remains. He is determined to kill the child, wanting to wipe out all traces of the family just like his. He wants to kill that child since he does not want it to carry forward the Nawab's (played by Deepak Parashar) name will still remain, which he doesn't want. You see, the director, Padam Kumar, didn't want me to cry too often, as he felt that I would get too much sympathy. But there are some scenes, in which I have cried. Like the scene when my sister is getting buried and I have to throw some mitti (mud) on her -- we're a Muslim family -- but I just couldn�t. I just clutched on to her teddy bear. It is the Imaam who helps me throw mitti on her. So there are moments when I get sympathy, too. There is a cause for my villainous actions. I'm not one of those guys who are just bad, for no rhyme or reason. How does Sunny Deol fit into this picture? Sunny Deol is like a daydreamer in this film. He wants to be a cop. So he keeps dreaming about being one. He dreams of saving a minister's life, and he thinks of himself being a hero. But then, his grandmother wakes him up and starts yelling at him and telling him to go to the fields and do some work. The fact is, he does become a cop. His first assignment is to protect the family, which Naseer is out to erase. That is how we meet in the film. Where does Manisha Koirala fit in? See, I don't have many scenes with her. Manisha has a very peripheral role. I mean, for someone of her calibre, she hasn't got a memorable role. But I really feel that for someone like her, who is so good and has done so well, this is just another film. You know, one day, she reported two hours late on the sets. Everyone was quite frustrated because she was late. She learnt her lines and shot eight takes that day. She did them so well that she looked as if she were saying each line for the first time! I mean, each time her lines looked like virgin lines. It was a scene where she had to break down, collect herself and accuse a man. The way she did it was just great! She is a sensitive and fantastic actress. How does it feel working with Sunny Deol? Wonderful. I am in complete awe of him. You see, I was in school when Betaab was released. Sunny has a great fan following in North India. I am from the North, I was a great fan of his. I love action heroes. Once, while shooting for Champion, I injured my hip bone. I had to take painkiller injections. But the crew wanted to finish the sequence. The problem was if we hadn't shot that day, the sets would have to be recreated or we would have to go back to Ramoji Films, Hyderabad, just for that one scene. Both would have been expensive. Sunny refused to do the scene. He asked in Punjabi, "Hum kya kasai hain? (Are we butchers?) He has got hurt so we really can't shoot this scene now." He's such a sensitive human being. Aren't you worried that you might get categorised as a villain? 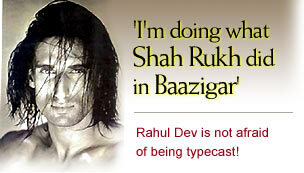 I mean, Shah Rukh did it twice, though I don't look like him at all. He has this cute teenybopper look, while I have this 'man' sort of look. I'm just doing this out of instinct. I'm not thinking about the future. I'm not worried about being typecast. I'm just here to act. To the best of my ability and to be recognised as a good actor. It all depends about how people accept you -- if they accept you at all! If I don't get an opportunity, there's nothing I can do, but I have got a chance. I'm doing a lead role in a film titled Akshamya, but now its changed to Mukth. It is about the recent massacre of Kashmiri Sikhs by extremists. The film talks about one family, where the hero's father is killed. What is your role in Ashoka, The Great? I play a good guy -- I am the Senapati of Kalinga. As you probably know, there were two states then -- Kalinga (modern Orissa) and Madhad (modern Bihar). I'm the protector of the historical figure, Iyar (whose name is Aryan in the film). I can't tell you much about the film, because Santosh Sivan is a little sensitive about the film. What is it like working with Shah Rukh Khan? Shah Rukh was my senior in school. We were in Columbus in New Delhi. We used to play cricket together. He was the wicket keeper. He's good fun! He's one guy I know who can truthfully claim that he always wanted to act. He was an active participant at our school dramatics. He always had the central role in most of the plays. I remember, he was the Wizard in Wizard Of Oz. Any special incidents with him? With him, we had to work all day. I mean, we had to report to the sets on time. If we had to clock in at 5 am, we did. I remember we were shooting at Panchmarhi. On the last day, we had a party. The music was mostly Shah Rukh Khan songs. And Shah Rukh himself entertained us. He danced to Chhaiyya chhaiyya, and all the Baazigar and Baadshah songs, even though he had a knee injury. So he is quite sporty. He hasn�t let stardom get to his head. What is the difference between working with Santosh Sivan as compared to Padam Kumar? He (Santosh Sivan) is very organised. quite strict. If you're working with someone as great as Santosh Sivan, you would want to give him your best, anyway. So everyone was on call. We would really work hard the whole day. And at night, we would work out in the gym. It was quite tiring. But in Champion, there was no call time as such. If the first shot was scheduled for 9 am, it would happen at 11 am, which is disappointing. Paddu couldn't really control everyone. He is still new, so I guess he still has to prove himself -- people may not have seen his work yet. You were reported to have bid for the lead role in Kabhi Khati Kabhi Meethi, opposite Kajol...? No. Never, ever. I never said! Are you sure it is me? Rahul Bose, maybe. Or was it Arjun Rampal? What is the film about, anyway? I will concentrate on films. Now I have Mukth, Ashoka and Ashique, and don't get much time for modelling. On priority basis, it is films for me.